← Cupcakes and Caramels, made locally with love. 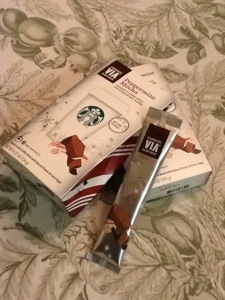 Viva Starbuck’s Peppermint Mocha Via! Mmmm…this is good. 8 oz. of hot milk plus a packet, and you have a peppermint mocha. I add extra coffee for a little more zip. A dollop of whipped cream and you’ll think that you’re at the North Pole. All this without needing to utter the insipid “I’ll have a grande….” Horray! Posted in Christmas, coffee drinks, Dark Chocolate, Minty and tagged dessert, food, hot milk. Bookmark the permalink.